Bloom: Continual blooming. 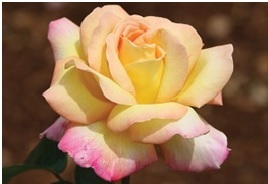 Large, heavy cupped to high centered 6″ blooms (petals 45) on what should be a strong growing continual blooming bush with large, rich-green, leathery foliage. Interesting Facts: Makes a good cut flower.